Bookmarks are important footnotes for us in the Browser. We usually save important Webpages URL or other URLs to our Browser so that we can get it later. If you are moving to a new computer, then you will be facing the issue for transferring the important stuff from your old PC to a new PC. Here, we are talking about Bookmarks only. You will get the simple method to transfer bookmarks from one computer to another without using an Internet connection or any third party tool. Let’s start! Let’s start a detailed guide for Google Chrome Browser. To transfer bookmark to another pc you must first export the bookmarked pages. Step 1: First Click on the “Google Chrome Menu” on the top right corner of Chrome’s browser toolbar. Step 2: Take the mouse over “Bookmarks”. A list will open beside it. Step 3: Here Select the “Bookmark manager”. Step 4: Click the “Organize” menu or the Three White Dots at the top right corner of it. A list will unfold. 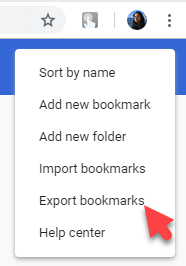 Step 5: Now Left-Click on “Export Bookmarks”. Step 6: A “Save As” box is going to pop up and your bookmarks will be exported as an HTML file in Chrome and will be saved in the drive you have selected. You can import this HTML file into another browser. You can save the file in External Hard Drive or USB flash drive, and you can transfer it to another computer. Now after you export the bookmarks you have to import bookmarks for successful bookmark transfer pc to pc. Step 1: On another computer open any browser (here we are opening Chrome). Step 2: At the top Right side, click on the “Google Chrome Menu”. Step 3: Take your mouse cursor over “Bookmarks” and then Select “Import Bookmarks and Settings”. A box will open. Step 4: Now select the “Bookmarks HTML file” from the drop-down menu at “Import bookmarks and settings” menu box. Step 5: Click on “Choose File” now. 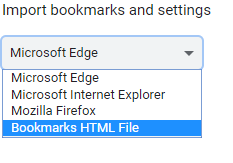 Step 6: You will be able to choose the HTML file that contains the bookmarks. Step 2: Click on the “Google Chrome Menu” situated at the top right side. Step 3: Select “Bookmark manager” from “Bookmarks”. 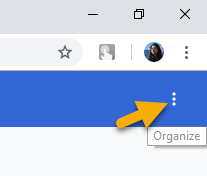 Step 4: Click on the “Organize” menu in the “Bookmark manager”. 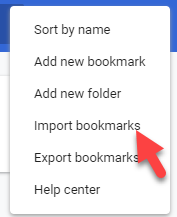 Step 5: Select “Import bookmarks” option. Step 6: Open the saved HTML file that contains the bookmarks. That’s It. Now you have successfully transferred the Bookmarks from your old computer to a new computer. A similar concept can be used for other browsers like Firefox, Internet Explorer, Opera etc.